NEW YORK CITY – It's springtime in Manhattan, and everything's coming up roses. That goes for the NYC hotel scene, too. The latest crop of boutique properties takes great pains to brandish their personality, aesthetic, and point of view. From lobby hangouts to in-house dining rooms to specialty amenities, they're making it very hard to ever want to leave. Heck, they're even drawing the locals inside. A look at a few in full bloom. 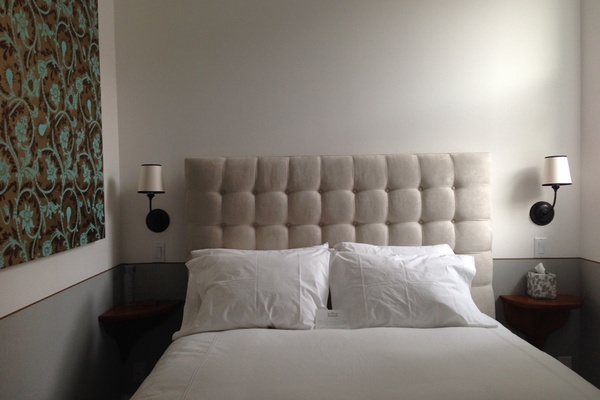 Specs: Hotelier Sean MacPherson (, , ) sails onto the otherwise unremarkable 8th Street thoroughfare with 180 rooms beckoning up-and-up artists/designers/writers and would-be creative types. 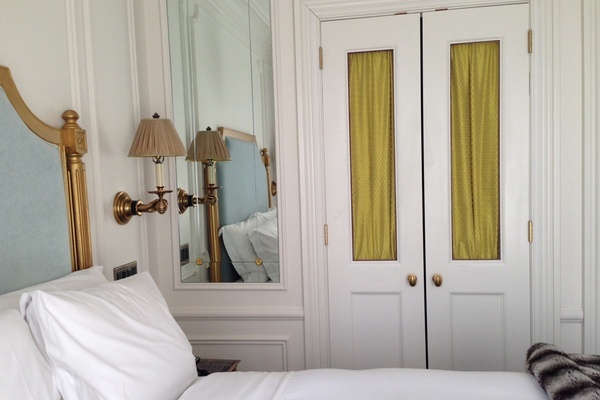 Pluses: Channeling a Parisian hôtel particulier in Greenwich Village, this place is elegant without having an ounce of snobbishness. The cozy lobby living room has lots of seating, a cafe kiosk, free WiFi, and a roaring fire; bistro has a solarium perfect for quiet breakfasts (complimentary for guests) and two-top banquettes for buzzy dinner dates. The rooms are bright and feminine (crown moldings, brass fixtures, marble bathrooms, herringbone wood floors) and reasonably priced. Request rooms on the 11 or 16 line; the 03 line includes bathtubs. Minuses: Aside from the suites, rooms, though utterly charming, are small (125 square feet) or smaller (100 square feet) and best suited for one person or a couple that really likes each other. Unique Selling Point: There's a subtle coolness factor that feels organic. I've dropped by on several occasions (breakfast, mid-day coffee, evening drinks in the lobby), and the place always has an insidery feel, like a well-kept secret. It's like hotelier Sean MacPherson's signature scent. Specs: A French foursome opened this 14-room hotel after decades defining Soho's Frenchy cafe culture at Soho Steak, L'Orange Bleu, and Jean Claude. Pluses: Despite being a block from the insanity that is lower Broadway, the tiny hotel is flying under the radar. With just a handful of rooms, it feels secluded and special. The gift shop may be the size of a closet, but it has a design-driven, eco-themed selection of merch. Ivy-laden balconies overlook an interior courtyard and tucked-away cafe. You could trick yourself into thinking you live there. Minuses: It's New York. 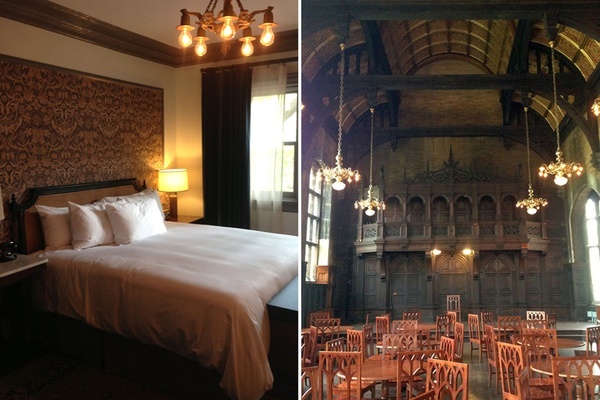 Should we be surprised when rooms are pricey? These are tidy and neat, but lacking in homey details. Unique Selling Point: The interior courtyard — decorated with over-sized lamps, Moroccan floor tiles, rattan bistro chairs — is not, unlike every other outdoor seating area in NYC, overrun with crowds. Great for taking a meeting or catching up with friends. Specs: The former Cooper Square Hotel has been reappropriated by the Balazs-o-sphere. Enter through the unassuming former tenement building next door to find the adorable check-in counter. Pluses: A 21-floor glass tower means floor-to-ceiling windows and lots of light. Cafe Standard is handsome as all hell and has sidewalk seating on a prime people-watching avenue. Restaurant is a real treat, from Michelin-star chef John Fraser's California cuisine to the Scandinavian Shaker decor. Minuses: The throw pillow is a nice touch, but the rooms feel a bit stark and reminiscent of their past hotel life. And about that popular Narcissa? Good luck getting a dinner reservation. Unique Selling Point: When booking, tell them if it's your first or fiftieth time in NYC, and they'll give you a matching view. Specs: The 240-room hotel is a sophisticated outfit designed by Roman and Williams. Pluses: It's a new midtown option for those with downtown sensibilities — all brass and marble and wood and very attractive. 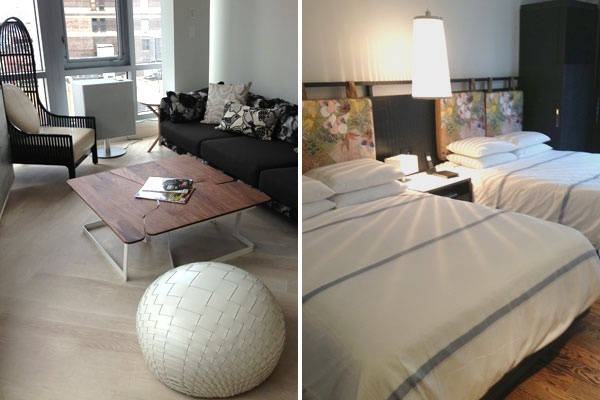 Rooms are compact but incredibly stylish, with custom furniture that fits like a glove. Kick back with a barrel-aged Negroni at Marc Murphy's good-looking restaurant next door. Minuses: With a Midtown location, you sometimes get a Midtown crowd. Keep that in mind as you head to the rooftop bar at happy hour. Unique Selling Point: Every detail of the penthouse suite (stocked bar, shower views, parlor furniture) is custom-created and impeccable. Specs: Housed in the gorgeous, Gothic building formerly known as the Desmond Tutu Center, the Chelsea hotel is an understated gem on one of New York's prettiest residential blocks. 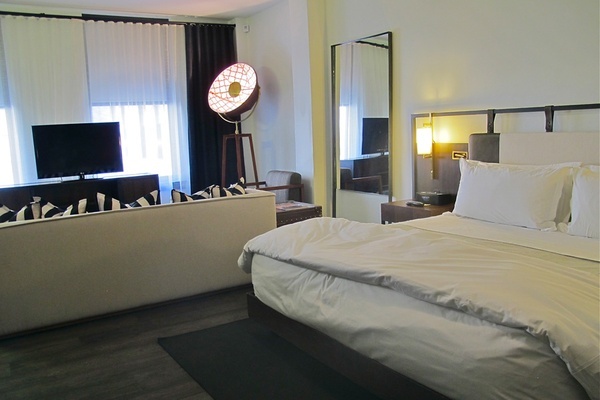 Pluses: Rather than capitalize on Zeitgeisty hipness, the 60-room hotel goes for refreshingly subtle sophistication that works beautifully within the existing space. Rooms have homey details (fireplace mantels, shelves of books, chandeliers, live plants) and large windows facing . Intelligentligentsia Coffee pulls espressos on the first floor. Unique Selling Point: Private garden grounds (including an actual lawn!) are practically unheard of in the area. The hotel also has many private party spaces including an old, stunning refectory with beveled glass and flying buttresses. Specs: The cozy retreat includes a bistro and 113 rooms designed by Canadian firm Andres Escobar. 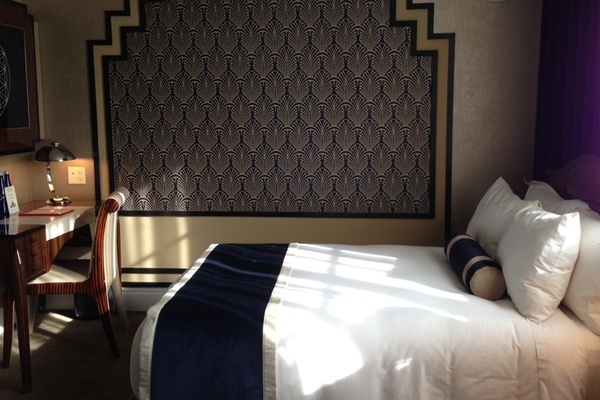 Pluses: Beautiful exterior with Deco touches inside (headboards, wallpaper, C.O. Bigelow toiletries, rotary phones). The 03 line of rooms has great light. The Double-Double rooms are perfect shares for friends in for the weekend. Minuses: There's a funny lobby layout with an eclectic mix of furniture that doesn't quite knock it out of the park. In-house bistro Grape & Vine has the right look but no buzz (maybe some would consider that a ). Unique Selling Point: Location, location, location. A rarity on a residential street in Greenwich Village, it feels truly neighborhoody. And the bistro has a working fireplace, a hot (literally!) commodity come winter. 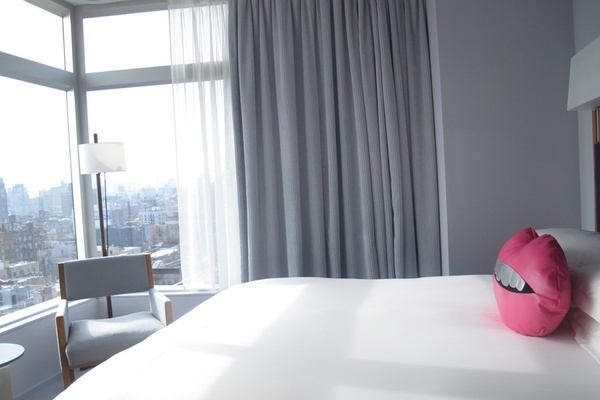 Specs: Right off Columbus Circle, the 208-room hotel is an exercise in minimalist opulence. 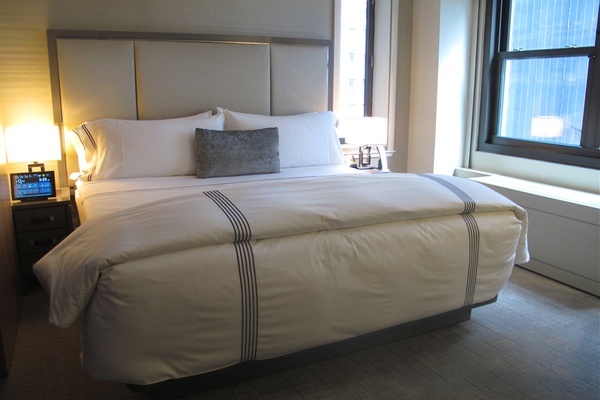 Pluses: It's high-end adult-contemporary — with in-room flowers, Duxiana beds, Fresh beauty products, and a direct hotline to Bergdorf — and perfect for uptight business travelers who want to be uptown. Minuses: Though the hotel insists there's a strong tie to NYC arts and culture, the street art feels out of place on the walls. Unique Selling Point: The hotel's attachés wrangle hard-to-come-by tickets and reservations for high- and low-brow happenings all over the city. A+ for service effort. Specs: There are 178 rooms and suites, several with roomy balconies, on a not-too-noisy stretch of Fourth Avenue. Pluses: This hotel sure doesn't look like a Hyatt. The design is notable for its whimsy and sheer ubiquity — from the classical exterior moldings to the bedroom ceilings. The fantastic in-house restaurants, (airy and upstairs) and (cozy, downstairs), are run by local restaurateurs Jo-Ann Makovitzky and Marco Moreira, the couple behind Tocqueville and 15 East. Minuses: It's still a Hyatt. 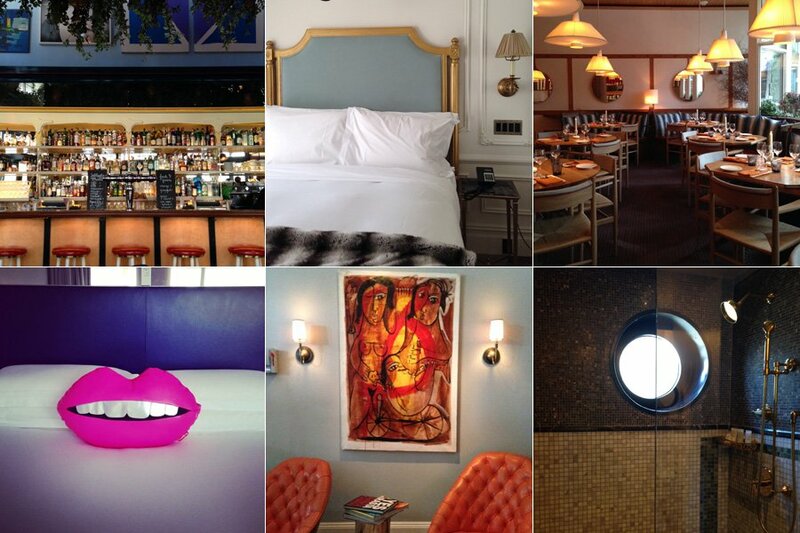 If your travel philosophy is boutique all the way, no Hyatt will cut it. Unique Selling Point: Union Square may be the single most convenient location to everything in New York — east and west, uptown and downtown, and all of Brooklyn. If you have to stay at a big chain hotel, this will let you pretend you're not. Specs: Tapping into its former life as a hat factory, this Garment District property sees itself as the hotel for the fashion industry. 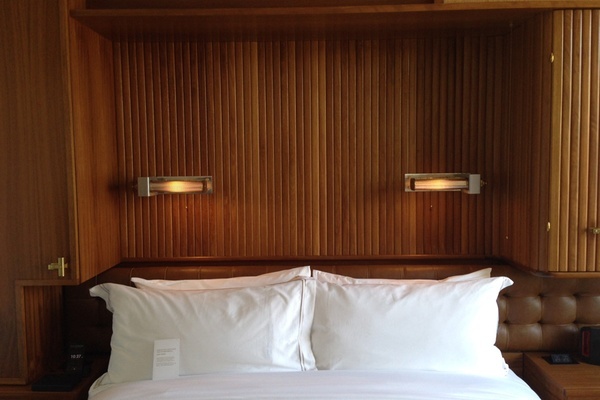 Pluses: Very nice, clean-lined, modern rooms have desks made from sewing machine bases, walk-in rain showers, great mini bar selections, and toiletries from Le Labo. Minuses: There are so many trends happening at once in the lobby lounge and restaurant (Mid-century modern, new Brooklyn artisan, 1950s throwback, Neoclassical grandeur, industrial grit, old-timey New York) that it just feels muddled. Unique Selling Point: It's rare to find any semblance of cool anywhere near Penn Station. The rooftop lounge has a view of the Empire State Building and is a nice respite from hordes of daily commuters and Macy's tourists.